When you need RV campgrounds to park your RV in for a night or two, Lakeside RV Park welcomes you! Call (318) 453-5442 today! 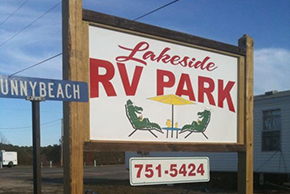 Since 2005, Lakeside RV Park has been offering excellent deals on high quality RV camping, campground camping, and more! Located in Minden, LA, our RV Park is close to many restaurants and a shopping center for your convenience. We offer great deals on our RV sites, as well as our campground sites, and areas that beckon you for outdoor activities. Lakeside RV Park is a secure place to bring the family because the local police officers of Minden make patrols through our park, helping to keep it secure for your peace of mind. We also provide our guests with some amenities to help you better enjoy your stay at our RV Park and campground. We offer showers to our guests with hot water, washer/dryer services, free Wi-Fi, and we even allow pets, as long as they are kept on leashes or inside of your RV. These amenities certainly make it easier for many of our guests to enjoy their stay with us, especially for first-time campers. You’ll find that our RV park and campground has a beautiful balance between nature and modern conveniences in order to deliver a great camping experience to one and all. Whether camping is a passion, a hobby, or just something you enjoy every once in a while; Lakeside RV Park and campground is your perfect choice! Give us a call today and we’ll tell you more about our great pricing and any deals we may be running. I-120 exits 44,turn right at the traffic light in about a mile on the right is Lakeside RV Park!